Right on the water of Lahaina Town’s Front Street, Kimo’s Maui offers oceanfront dining, live Hawaiian music, and heavenly cocktails. Kimo’s famous Ali’i Mai Tai cannot be missed. Known as the King of the Mai Tais, the handcrafted cocktail features Kauai’s Koloa Spiced and Dark rums, passion juice, fresh orange juice and homemade sweet and sour. However, Kimo’s Maui bar in Lahaina also offers an array of mouthwatering cocktails from tropical classics like Lava Flows and Pina Coladas. Located in Wailea, Monkeypod Kitchen has one of the best drink selections in all of Maui. Their bar menu is composed of unique twists on traditional, modern, and tropical drinks. Monkeypod Kitchen utilizes various local ingredients throughout their recipes and offers one of the largest selection of craft beers on Maui. The Maui bar offers 36 craft beers served at 29 degrees ­ the coldest on the island, and a wine list full of varieties from around the world like Europe, South America, Australia, and Lebanon. With Pacific Ocean views and nightly live music, Monkeypod Kitchen will have a drink design for you. 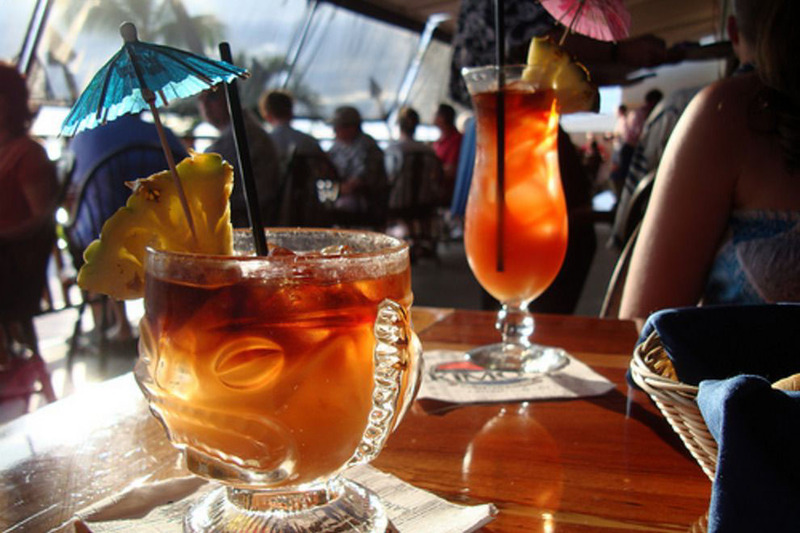 Located in Lahaina, the open-air beach bar is named after Maui’s “Father of International Surfing” Duke Kahanamoku. Honua Kai Resort’s beach bar and eatery is ultra­ laid back with tiki torches, surfer decor, and vistas. Make sure to visit the Maui beach bar during happy hour, every day from 3­5pm, offering a “barrel to glass” menu where amazing wines are served on tap straight from the barrel. Duke’s Lemonade is also available for guests who are not a big fan of wines; the drink is a refreshing combination of citrus vodka, lemonade, and a touch of cranberry. Tiki Bar and Grill is located at the Kaanapali Beach Hotel and was the first outdoor bar in West Maui. The poolside bar offers Pacific Ocean views and only a few steps away from the sand. Maui’s Tiki Bar and Grill offers traditional tiki cocktails, beers, and a multitude of other drinks. The traditional Maui Tiki bar is one of Maui’s hidden treasures with great vibes and powerful drinks. Favorite drinks of Tiki Bar and Grill include their classic Mai Tai, Tiki Tini, Coco Loco, and Tropical Itch. The Tiki Bar and Grill is an excellent spot to grab a drink and enjoy nightly Hawaiian music and Hula show.